Informtainment.com by ORLANDO: Facebook: include your name in web search! 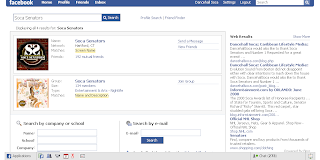 Facebook: include your name in web search! By accident, I discovered a tool facebook is using on their interface. While checking out a friend of mines page, I noticed that there were web results to the right. The results included prior blogs and post about the "Soca Senators". I took a snapshot of the screen (above) because this illustrates a positive for myself as a business owner. All the links were past mentions of "Soca Senators" @ DancehallSoca and Informtainment. However, this may not be something private citizens may want on their facebook pages. It is important to note that I only saw the web results when I searched for "Soca Senators". This is beneficial to companies, celebrities, DJ, etc., because web results will include links to the website where the person on facebook is mentioned. I wonder if facebook will extend their search to include paid search for certain terms? Bing is responsible for this web search result and this maybe a relationship already created or in the making.